Best of the Nest 2018: "Best Family Dining"
A locals' favorite, Jackson’s Corner continues to elevate the casual dining scene in Bend year after year. High quality, local ingredients grace the plates at Jackson’s all day long, with custom coffee creations, house baked breads and brick oven pizzas, to organic salads and delicate pastas quality is consistently part of the recipe. A giant grass family area for family fun. In addition to having a beer on site, you can load up on bottles of wine or a variety of hard-to-find microbrews from its giant cooler—all while feeling much more sophisticated than when you stock up at the gas station. This neighborhood joint does it all with integrity. 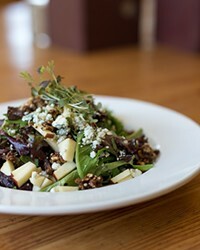 The Jackson’s Bleu Salad features just the right amount of smoky bleu cheese and sweet candied walnuts, and house-made pastas are generous and scrumptious. All breads baked in house. Sun., April 28, 7-9 p.m.